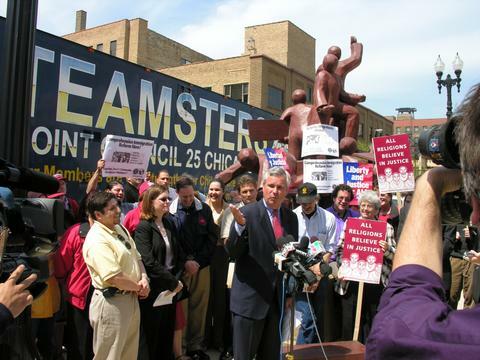 On April 24, 2006, Chicago Federation of Labor was at the Haymarket Riot Monument to review Immigration Reform. Dennis J. Gannon gave a great speech. Tom Stiede of Teamsters District Council gave a fiery speech. Jorge Mujica gave a strong passionate speech about respecting hard working immigrants. It was great to see many Union leaders at the forefront of this difficult issue. Some unions guys could not attend as they were busy getting their car washed. Dennis J. Gannon Clout Rating: Yep got Clout. Photo by Patrick McDonough. Thanks for this thing about a “strong passionate speech “. If I remember well, what I said was that this is not (only) about immigration papers, because we don’t want to go from “Poor undocumented workers to poor documented workers”. I just insisted on the fact that we won’t get salary increases along with the immigration papers, or health care, for that matter. We have to organize in labor unions to be able to fight for that.